Following a breakthrough that was made in 2006 (by Takahashi & Yamanaka), today we can reverse cellular differentiation, and generate induced pluripotent stem cells from somatic cells by epigenetic “reprogramming”. 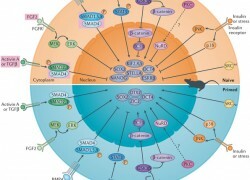 We investigate what are the dramatic molecular changes happening in the cell during reprogramming and how they are connected to similar in-vivo processes. We pointed out two chromatin regulators that play a role in this process, one is essential for reprogramming (Utx, Mansour et al 2012), and the other (Mbd3, Rais et al 2013) is an obstacle, which upon its near-removal the reprogramming becomes dramatically faster and synchronized. Being able to generate all cell types, mouse embryonic stem cells are a most valuable tool for research. They can be found in the developing mouse embryo in two distinct states: naïve - in the blastocyst, and primed - in the post-implantation epiblast. These two states are distinct in various aspects, most notable, only naïve cells can contribute efficiently to chimera. Naïve and primed cells can be sustained in-vitro, and are dependent on distinct signaling. In human, naïve stem cells were out of reach for a long time. We investigate the regulation of naïve and primed pluripotent stem cell in mouse and human. Specifically, we were able to maintain human stem cells in a "naive" state, with distinct molecular and functional properties, including enhanced ability to contribute to cross-species mouse chimeric embryos (Gafni et al, 2013). In addition, we found that mRNA methylation has a critical role in facilitating degradation of pluripotent genes, an essential step during the switch from naïve to primed states, both in-vitro and in-vivo (Geula et al, 2014). Our current studies involve elucidating molecular regulation of these states across different species, and define how their molecular architecture dictates their functional competence.